FIFA 15 Ultimate Team continues with everything. After releasing special cards dedicated to the highlights of the Bundesliga, it was time to present the Spanish Championship with the traditional team of the season, which brings improved versions of players like Cristiano Ronaldo and Messi. Released on Wednesday (10), the cards will be available until the 18th. The packs can be found exclusively in gold, the way sold in the store. Among the major players are Cristiano Ronaldo and Messi, who once again appear among the most skilled. 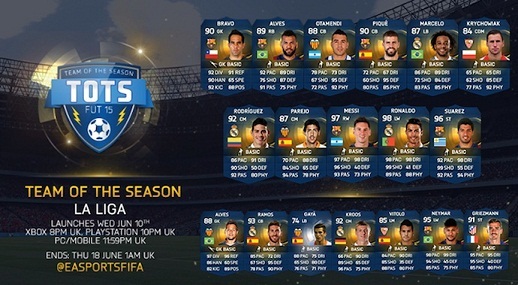 Other athletes were rewarded striker Suarez, Barcelona, James Rodriguez, Real Madrid, and the defender Otamendi. The list also has Brazilian players Dani Alves, Marcelo, Diego Alves and Neymar Jr ace, champion of the Champions League with Barcelona, with the right goal in the final against Juventus. Besides rare to find, the packs also prey on the game market, thanks to the very high resale value. Items are one of the trademarks of the game and are available in all versions, including smartphones and tablets.